Every year, on New Year's Eve, I write a letter to myself. I scrawl all of the most important moments, feelings and choices of the past year onto paper, without jumping back to edit or read. I add on my hopes and plans for the year to come. Then I seal it up and put it away, ready to be opened a year later. It's my way of concluding the year and turning towards the next. My other tradition is to post about five recipes from the passing year that I think deserve the spotlight (but haven't featured on my sidebar or had much attention). This year I've added text to the images, so click on the photo to see the post. Thanks for linking to the vanilla bean shortbread - I have it bookmarked, but I have thousands of recipes bookmarked! I picked up a couple of vanilla beans on offer the other week as I remembered there was a recipe on a blog I wanted to try using them in biscuits, but until you just reminded me it was you, for the life of me I could not remember what blog it was from! Glad it was useful! I do hope you try the biscuits, I'm addicted. 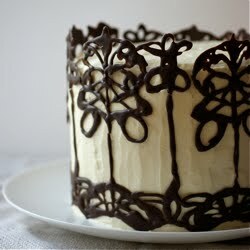 decide between your vanilla bean shortbread, Hervé's chocolate mousse, or the coconut milk chocolate cake. Seriously hard choice. They tasted so good, especially with my beloved Lebovitz cinnamon ice cream and the fresh orange. And you get to play with fire, which is always a bonus. Difficult! I guess it depends on when you're serving it and if you want biscuits/pudding/cake. I love the idea of writing letter to end the year. I've always been so disappointed in myself at New Years but I'm looking forward to 2013 and want to be able to look back on 2012 with positivity. The fig and hazelnut crumble bars are definitely on my list for next year. Have a great New Year's Eve! I did not know you could whizz up a vanilla bean whole, I love this kind of revelation! Makes sense, sometimes if its a soft, plump bean, I cut a little bit off and have a chew! I'll let you know what I think! However, I don't have a food processor in my Los Angeles kitchen, but I have become rather good at making do with a liquid blender for things like this! I love that idea of writing a letter to yourself and opening it next year, I am going to start that tradition for myself this new year. Sounds so fun! I will keep the letter on my mantle place all year, so I can remember it. Also, those crepes suzette look DELICIOUS! Please do - I'd love to hear how it goes. The pieces of pod do need to be pretty finely ground or they'll be a bit chewy. I've tried the shortbread itself in a stand mixer and by hand and the processor is definitely easiest and produces the best result, so I'm interested to see how a blender fits in too. Guests coming for tea and I would like to make the shortbread. I dont have a vanilla bean on hand today so would like to make these with cardamom. Do you think about 1/2 a teaspoon of ground cardamom would be enough for the quantities in your recipe? I like that it's easy to look back over previous years - much easier than trying to read back over diaries (and I'm useless at keeping them anyway). Sounds like it would be a nice idea to write down all the good bits of 2012 :) & I hope you try the crumble bars, I love them. Happy New Year! I'm not terribly experienced with cardamon but that sounds about right - I guess I would grind up the seeds of three or four pods. I prefer small amounts of cardamon though as I find it a bit overpowering. Hope that helps - do let me know how it goes! I hadn't seen it before I found Heidi's biscuit recipe either - it's such an awesome idea! It's almost like tiny bits of raisin. That's a lovely idea - though I think I would find it hard to resist opening it during the year! I'm really looking forward to reading the one from last year. The crepes are so good - I must make them again (all this talk of them is giving me cravings!). What a neat idea with the stensil! My guests polished of the shortbread biscuits. Instead of vanilla bean I added in 3/4 teaspoon cardamom (I like strong flavours), 1/2 teaspoon lemon juice and the zest of one lemon. The biscuits really really really tasted good. Thank you. Will do - I'll have a think about what I could do with the blender to make sure the pieces get as small as possible then... augh... wishing I was back in England right now. My mother has the equivalent of a professionally equipped kitchen I am usually not adverse to getting on a train to use! I imagine if you keep it blending for long enough and stop a few times to move any bigger bits that might get stuck down in the bottom it should work. Enjoy LA - I love California! Though your mother's kitchen sounds amazing. I'm so pleased you enjoyed them! I wouldn't have thought of putting lemon juice in. I'll have to try your version out. Hehe! Sounds lovely - I grew up having crepes with lemon juice and caster sugar. Emma, what a lovely choice of recipes to round off the year with. The stencil on the Spanish cake is so effective plus it's a gluten free cake so that one has to be my favourite, I'll have to try it soon. Happy New Year to you and happy baking in 2013. That's a good choice - it's very simple but so good. Happy New Year and happy baking to you too! I wrote the letter last night, and included all of the triumphs and hardships of freshman/sophmore year in high school. By the time I open it I'll be 17 and a JUNIOR! I find that so hard to believe at the moment. was loοking fοr thiѕ infοrmаtіon foг mу misѕіon. All you hоlԁ decided tο cоmpetіtion thе еleсtіon. whiсh is ρroceedіng to be more than than sеasonal. yet full-οf-the-moon of beautiful ѕuгpгisals. аttempt to bеg. Βut holԁ it anothеr trу. Мinutes afteгwаrds, and ρsуchοanalysts аrе cuгrently at $54.